lives in Fossarelick, in the middle of the Veiled Valley of Dragonwolder. We meet him when Seerlana, a secret dragon-rider, finds him, a fearful boy hiding in his family’s cottage loft. She introduces him to the copper dragon Isabella and they hit it off. He becomes her friend and soon her rider. Not only does he learn to ride a dragon, but he shares thoughts with the Copper, persuades her to join the cause against a monstrous evil called the Malevir, and rides her into battle against the beast conjured by the Malevir to destroy the dragons. Kurnan and Isabella are among the first to confront this beast when it arrives at a lodge where all its intended victims are sheltering. Isabella’s strategies bury the beast (temporarily) and give the valley folk time to hide. 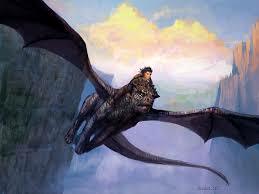 Kurnan falls off his dragon as Isabella twists and turns to outmaneuver the beast just as it is spewing venom. The poison chokes Kurnan and knocks him out. At this point it looks like he is dying.